Yesterday night I released new developement versions of GtkSourceView, PyGtkSourceView and gedit. 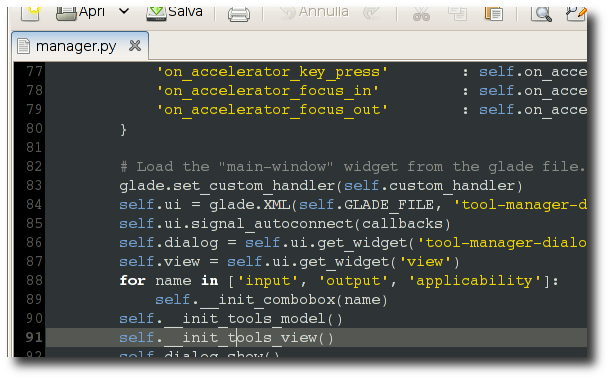 With this release of gedit one of the more important features of gtksourceview 2 will be visible: style schemes support. At least I’ll try to add buttons to install and remove schemes from file in the hope that a good collection of third party schemes will be soon available. By the way, if any of the Gnome Online people want to give it a try at creating a service to install Style Schemes from an online collection I surely will not oppose. Creating a style scheme is very simple: just create yourtheme.xml and drop it in ~/.local/share/gtksourceview-2.0/styles. Where element can be one of the builtin elements (like “text” or “bracket-match”) or a syntax element specified in the form “language_id:element_id” and color can be either specified directly as #NNNNN or defined in a palette. “def:element_id” stands for the default style for those kind of elements, since GtkSourceView tries to map the styles to reasonable defaults. Let’s make an example: if I write “while” in a C file, gtksourceview will try to lookup the c:keyword style, if that is not defined it will try to use def:keyword and if that is not defined either it will use def:statement. The minimal set of styles you need to define are def:comment, def:constant, def:statement, def:identifier, def:type and def:preprocessor, but obviously for good looking schemes some more tweaking is needed, like defining def:error or distinguishing def:string from def:constant etc. You will also probably need to define some language specific things, especially for things like diff files or xml files that do not easily map to those default styles. As said above we are really looking forward to see style schemes created by our users, thus we started a wiki page to collect them. Beside we are also looking forward including the best ones in GtkSourceView itself: currently we have the classic style (similar to gvim colors) the Kate style (similar to the Kate editor colors) and a Tango style, which however still needs a bit of tweaking since at least in my opinion it looks “too light”. We would like to include a couple more styles in gtksourceview of which at least one for dark backgrounds, so if you come up with a good theme or improve one of the existing ones (in particular tango.xml) do not esitate to tell us!